Although I believe in love and have nothing against celebrating this fabulous wonder of life I am not a big fan of Valentine's Day as I feel that it is an overrated, materialistic, artificial and very mercantile feast just like Christmas, New Year's Day or Mother's Day. Of course I am aware of the highly romantic origin of this festival (all around the world there are similar days honoring love), but I believe that one should express her/his love on a daily basis and not just once a year otherwise it feels kind of fake, contrived and totally unnatural. Why make things so complicated and follow the flock when you can free yourself from such ties and live your love in a much healthier way? It is for such reasons that I have never asked to be treated like a princess on Valentine's Day and never make a big deal out of it. My boyfriend is free to remember or not this date. I know that he loves me nonetheless. To tell you the truth we have very rarerly celebrated this day as we are unconventional people who don't believe in forced action. It would be a lie if I said that we don't enjoy being spoilt be the other or receiving gifts like anyone else, yet compared to others we don't limit that to one day of the year. Every weekend we organize charming tête-à-têtes, candlelit meals and always try to by as affectionate towards one another and show our feelings through little nothings (buying ones favorite chocolate, baking a treat, making a concession, helping the other in difficult times, being tolerant and respectful, etc...). Buying gifts is easy, yet showing real love for your partner demands more efforts. So when I received a box full of tea samples from "Le Palais Des Thés" (go in my blogroll for a link to their store) and was lucky to discover their heavenly "Thé Des Amants (translation: Lover's Tea) I knew that I was going to indulge my dessert-needy soulmate with a delightful homemade tea-based treat that would fill his tummy with love and bring some sweetness into the evening. It is undoubtedly one of my favorite flavored teas. It's sensual perfume is exhalirating and every wiff or sip of it uplifts your soul in the most wonderful of ways. It is a perfect blend of black tea that fits the Valentine's Day spirit very well as it is very rich, voluptuous, refined, suggestively fragrant. With it's hints of ginger, apple, almonds, cinnamon and vanilla you'll be under it's spell. 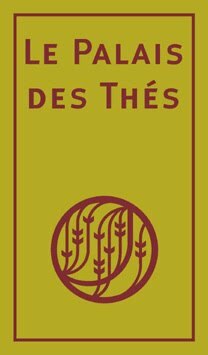 "Thé Des Amants" is such an exceptional tea and has a really amazing taste that it is impossible to just drink it, one also wants to eat it! Therefore I decided upon making a dessert that I found in my new bible "Bon Appétit Desserts: The Book Of All Things Sweet And Wonderful" and adding my own little twist to it. 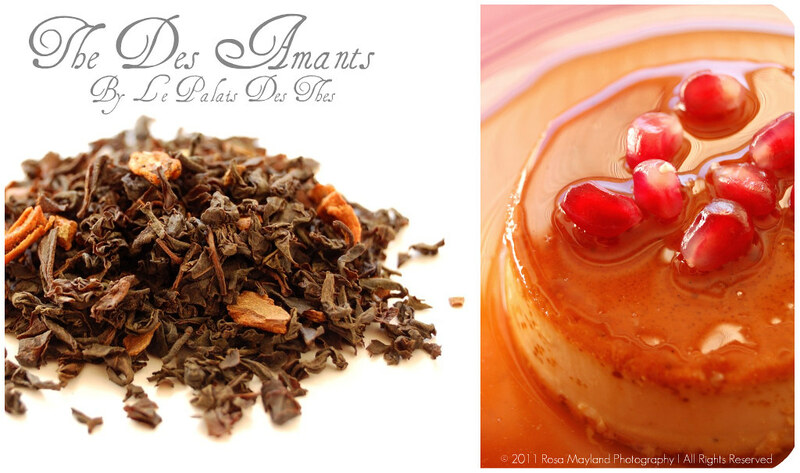 I thought that it would be interesting to create individual "Tea Caramel Flans" and instead of flavoring them with vanilla I opted for a more atypical and original way of seasoning that delicacy by steeping my cream/milk mixture with a few teaspoons "Thé Des Amants" tea . An amazing idea which gave excellent results. Anyway my "Tea Caramel Flans" disappeared as fast as I had made them! My boyfriend found them flawless and gulped them down with much pleasure. Mission accomplished! Recipe adapted from "Bon Appétit Desserts: The Book Of All Things Sweet And Wonderful". 1. Position a rack in the center of the oven and preheat to 180° C (350° F). 2. In a heavy medium pan, mix together the cream, milk and salt. 3. Over medium heat, bring to a simmer and add the tea, then remove from the heat and let steep for about 30 minutes. 4. Meanwhile, in another heavy medium pan combine 1 cup sugar and 1/3 cup water. 5. Stir over low heat until the sugar has completely dissolved. 6. Increase the heat to high and cook without stirring until the syrup turns deep amber (brushing down sides of pan with wet pastry brush and swirling pan occasionally), about 10 minutes. 7. Hastily pour the caramel into six 3/4-cup (180ml) ramekins or custard cups. 8. Using oven mitts as aid, immediately tilt each ramekin to coat the sides. 9. Put the ramekins into a rectangular deep baking pan and bring a medium pan of water to the boil (set aside). 10. In a medium bowl, lightly whisk together the eggs, egg yolks and 7 tbs sugar just until blended. 11. Gradually pour the cream mixture (through a sieve) into the egg mixture while continuously whisking without creating lots of foam. 12. Sieve the custard through into a Pyrex measuring cup and pour the mixture into the prepared ramekins, dividing evenly. 13. Pour enough of the hot water into the baking pan. It has to come halfway up sides of ramekins. 14. Bake for about 40 minutes until the center of the flans are gently set but still a little wobbly. 15. Transfer the flans to a rack and let cool. 16. Place in the fridge until completely cold, about 2 hours. 17. Cover with cling film and chill overnight. 18. Just before serving, run a small sharp knife around the sides of the flans, to loosen and turn over onto plate. Shake very gently in order to release the flans. Carefully lift off the ramekins, allowing the caramel syrup to run over the flans. If you don't want to use tea, then scrape a vanilla bean into the cream mixture (step 2) and add the bean. Don't overwhisk the eggs otherwise you'll not get a perfectly smooth edges. I suggest that you take the caramel off the burner when it's just "medium" amber rather than dark amber (it continues to cook and darken once off the heat). The flans can be made 2 days ahead. Serve for dessert and garnish with pomegranate seeds or berries (strawberries, blueberries and raspberries). Recette adaptée du livre "Bon Appétit Desserts: The Book Of All Things Sweet And Wonderful". 1. Positionner une grille au milieu du four et préchauffer à 180° C.
2. Dans une casserole moyenne, mélanger ensemble la crème, le lait et le sel. 3. A feu moyen, porter le mélange à ébullition et ajouter le thé, puis retirer du feu et laisser tirer pendant 30 minutes. 4. Pendant ce temps, dans une autre casserole moyenne mélanger ensemble de sucre cristallisé et l'eau. 5. Cuire à feu doux et remuer constamment jusqu'à ce que le sucre soit complètement dissout. 6. Augmenter la température (haute) et faire cuire sans remuer jusqu'à ce que le sirop devienne ambré (tout en remuant délicatement la casserole pour répartir le caramel mais sans éclabousser les parois), pendant 10 minutes. 7. Verser rapidement le caramel dans 6 ramequins de 180ml chacuns. 8. En se protégeant avec des gants, immédiatement remuer les ramekins afin que le fond et les côtés soient recouverts de caramel. 9. Mettre les ramequins dans un plaque de cuisson profonde et remplir une casserole moyenne avec de l'eau, puis portez à ébullition et mettre de côté. 10. Dans un bol moyen, battre (légèrement) ensemble les oeufs, jaunes d'oeufs et 7 CS de sucre cristallisé afin d'obtenir un mélange homogène. 11. Verser graduellement le mélange à la crème (en le filtrant) dans le mélange aux oeufs tout en remuant sans créer de la mousse. 12. Filtrer l'appareil à flan et remplir les ramequins de manière égale. 13. Verser assez d'eau chaude dans la plaque de cuisson afin que l'eau arrive à mi-hauteur des moules. 14. Cuire pendant 40 minutes, jusqu'à ce que le centre des flans soit ferme, mais toujours tremblotant. 15. Transférer les flans sur une grille afin qu'ils refroidissent. 16. Les mettre au frigo jusqu'à ce qu'ils soient complètement refroidis, pendant 2 heures. 17. Couvrir les pots avec du film plastique et laisser au frigo tout une nuit. 18. Juste avant de servir, libérer les bords avec une couteau pointu et renverser délicatement sur une assiette. Secouer très légèrement afin que les flans se libèrent. Retirer les ramequ ins et lasser le caramel couler sur les flans. Si vous ne voulez pas utiliser du thé pour parfumer vos flans, alors ajoutez une gousse de vanille ouverte et raclée au mélange à la crème (point 2). Ne battez pas les oeufs trop énergétiquement autrement vous n'obtiendrez pas des bor ds lisses. Je vous recommande de retirer complètement le caramel du feu lorsqu'il est moyennement ambré et non quand il est trop sombre (il continuent à cuire et à brunir hors du feu). Les flans peuvent être préparés 2 jours à l'avance. Servir pour le dessert et garnir avec des graines de grenade ou des baies (fraises, myrtilles ou framboises). Your pictures are breathtaking, Rosa! I bet this is as delicious as it is beautiful...love the use of tea! YOu are truly talented in making such a woonderful Valentine's Day! awesome Rosa! 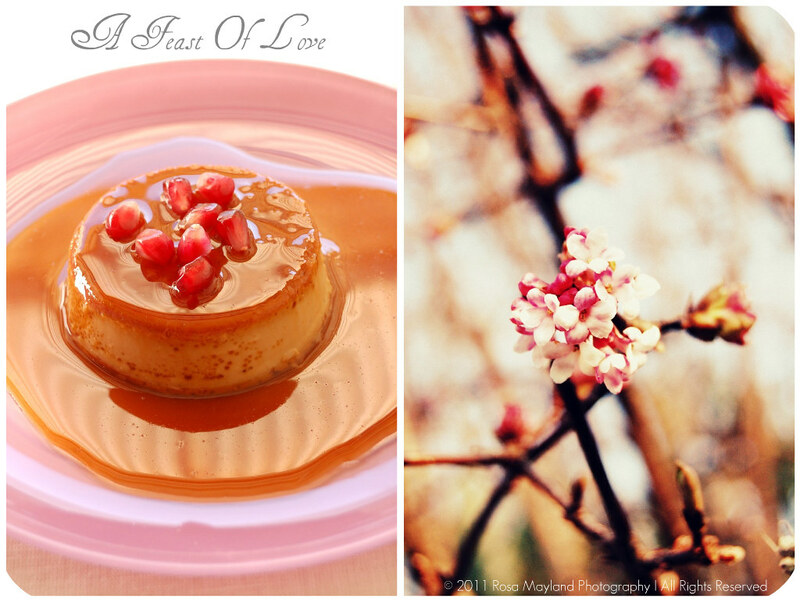 Terrific flan Rosa.It looks so smooth and delicate.Love the feel of pictures. Une très belle idée ce dessert ! J'aime bien l'utilisation du thé... Très inspirant ! :) Et les photos, toujours aussi belles !! Comme ce doit être bon cette crème avec thé! I really like this post, Rosa, and feel very much the same way. I know my man loves me and would rather be surprised throughout the year than have him feel pressured to go all out on this day. I do love the idea of celebrating love though. :-) It is a precious gift. The flans are lovely! What a lovely dessert Rosa. We believe in sharing our love all year long and not waiting for a special day. Gorgeous photos and gorgeous dessert! omg...Rosa, the tea flan looks to die for! Have a wonderful and sweet weekend! On adore ces flans là, nous en faisons souvent. Original avec ce thé ! Nice twist with steeping the tea for the flan. Hope you have a cozy Valentine's with someone special! Lovely! My "sweet" will be away this weekend and whisking back to me on the day. However, like you, we rarely celebrate on the day itself. This year, because he is away and we have time, the girls and I are planning a marvelous meal. We are looking for delicious items to create. My girls, 7 & 11, really want to make an entire meal of sweets. Your recipe will be going on the "make" pile. humm il est superbe ce flan revisité pour la st valentin! Je voudrais créer des catégories sur mon blog mais je n'arrive vraiment pas à le faire .. :S Pourrais-tu m'expliquer? WOW! Rosa, cette recette de flan au thé est absolument géniale. Elle a l'air délicieuse! Je ne peux pas manger d'oeufs, enfin pas autant d'un coup, et ces crèmes onctueuses et riches font bien sûr parties de mes desserts préférés. Et là, je suis obligée de dire, qu'elle semble être au top, mais elle a l'air parfaite cette crème. Tout à fait ce qu'il me faut après l'attaque de congères. Justement, je viens de rapporter une grenade énorme trouvée chez le maraîcher de ma soeur, elle serait bien en compagnie de tes flans. Comme toujours tes photos sont très gourmandes. Rosa, I saw your post on FB and have been thinking about these delcious flans all day! Yum! beautiful post rosa, i love your sweet creation...stunning results!! That is the perfect dessert! I agree with you regarding Valentine's Day...however this dessert is very romantic! Absolutely beautiful, Rosa. Perfect for Valentine's Day. While I do believe in Mother's Day (just because I want one day to be about me, lol! ), I totally agree with you on the artificial feeling of Valentine's. I would rather celebrate the day with chocolate instead of cards and heart shaped boxes! With that said, your dessert would be perfect to celebrate the love of someone special any day of the year. Always impressive, Rosa. It's like melt in my mouth, so smooth and silky looking. Drooling now. These look incredibly yummy. Creme Carmel is one of my favourite desserts and these look very similar. What a gorgeous dessert! I love flans, creme caramels, etc. and this is making me drool. Rosa, it looks fantastic! This tea must be delicious! What a great idea to incorporate it into a dessert. I wouldn't mind the holes, actually, I like them. In Brazil there is a very popular caramel pudding that everyone tries to make WITH the tiny holes! The more, the best! If it comes out without any holes it's kind of disappointing! I agree with what you think about Valentine's day. My friend is worrying so much about making the ift special and spending money on the artificial gifts from the stores. Anyways I love the tea flavoured flan and I must try it out soon! Tea is such a versatile aroma. Oh la la,je craque.Et tes photos,toujours aussi belles. A brilliant idea, Rosa, to flavor your flan with that marvelous tea! I would love to try it. Perfect Valentine for YOUR Valentine! And I love the pomegrante arils on top! 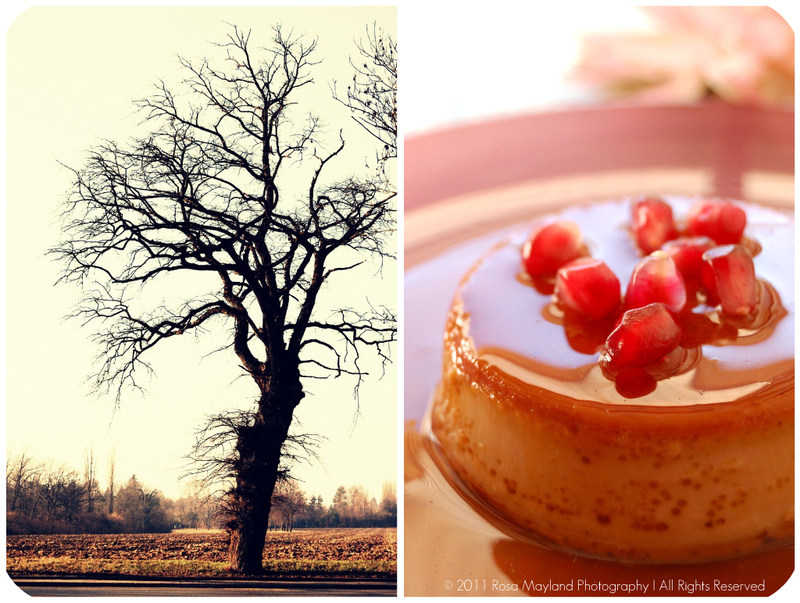 Such an original idea for flan, and as usual, beautiful photos. This sounds wonderful! I love flan, and the flavor from the tea must have been a delight. C'est super joli et gourmand comme tout! Wow- I might have to give this recipe a shot! Hispanics are big on flan, but I've never made it myself and this looks amazing. One question, is castor sugar a liquid sugar, like corn syrup? How do you stay so thin???? ha. This dessert is refined and beautiful and reminds me of the desserts we would get at the Mariage Frères store in Paris, where all their desserts are flavored with tea. lovely! i've made orange blossom tea before and it's soo good. This looks so creamy. Nice work! Great minds think alike as you know I featured one yesterday, too! Oh, dear me, Rosa! How beautiful is THAT? I feel happy just looking at your flan. Thanks for sharing such a wonderful treat. J'ai bien peur de n'aimer ni les flans ni la ST Valentin. Mais c'est un tel plaisir de venir te lire et voir tes photos. Quel talent. I'm with you on your outlook on Valentine's Day - but your flan sounds delicious, the tea an intriguing inclusion and is perfect for any special occasion. My bf and I won't be "celebrating" Valentine's Day as such - we both got a Thai massage yesterday and counted that as the celebration. Beautiful flans! Love the pics!! I'm not surprised your bf enjoyed these. They look delicious. Love the sound of the teas, too. 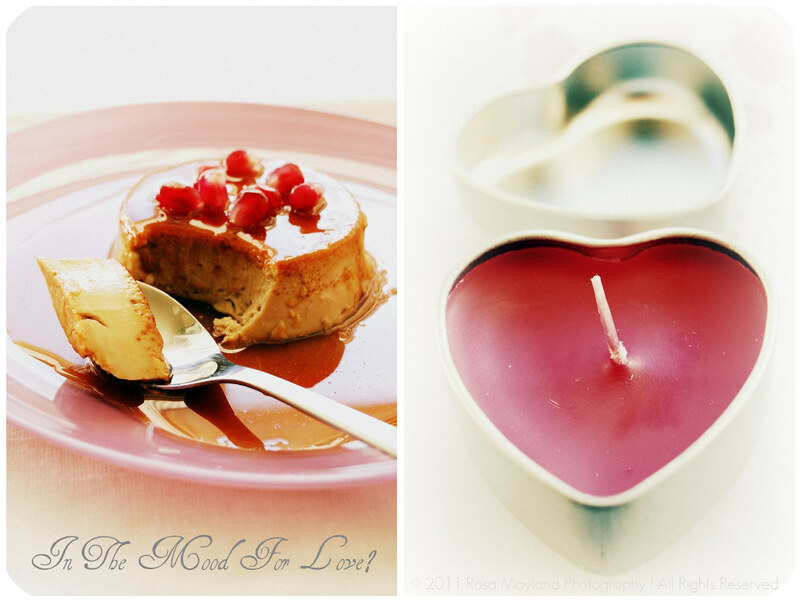 Perfect desserts for Valentine's or any other day. What a unique experience your lovely flan must be, Rosa. That looks absolutely lovely Rosa! Ohhh wow this looks super delicious!!!! I don't believe in this commercial celebration of love either. Making something homemade for our beloved ones is an act of love and we do it year round. I have never made flan before, so I will put this in my list to do. It sounds delicious. I have not heard of this tea before. The flans look wonderful. I really love the sound of it! Oh boy, this looks really yum! I love flans! Ca l'air merveilleuse et delicieuse! I get it about V-Day being overrated - but dang girl, you have a beautiful recipe to showcase this holiday of love...... gorgeous dessert! I love flan and the topping is a great idea. Ton flan est super glamour ! Lucky you for getting wonderful tea in the post and what a brilliant recipe. Valentine's Day is so commercial but I think it's nice to produce something homemade and special to celebrate. Propaganda perhaps, but if you celebrate things for the true meaning then the propaganda will take a back seat. Lovely post and even more lovely and delicious is this flan. Happy Valentine's Day! the new site is ellemarie.jp, hope you'll bookmark it and come visit me. Bien d'accord avec ta façon de voir cette fameuse Saint-Valentin ! ;o) Quant à cette crème caramel, elle, elle me plaît beaucoup ! Chere Rosa, j'aime la facon sincere dont tu exprimes tes idees . Je suis completement d'acord avec toi sur tout ca, chez nous on ne l'a jamais fetee (pas plus que les autres Saints d'ailleurs). 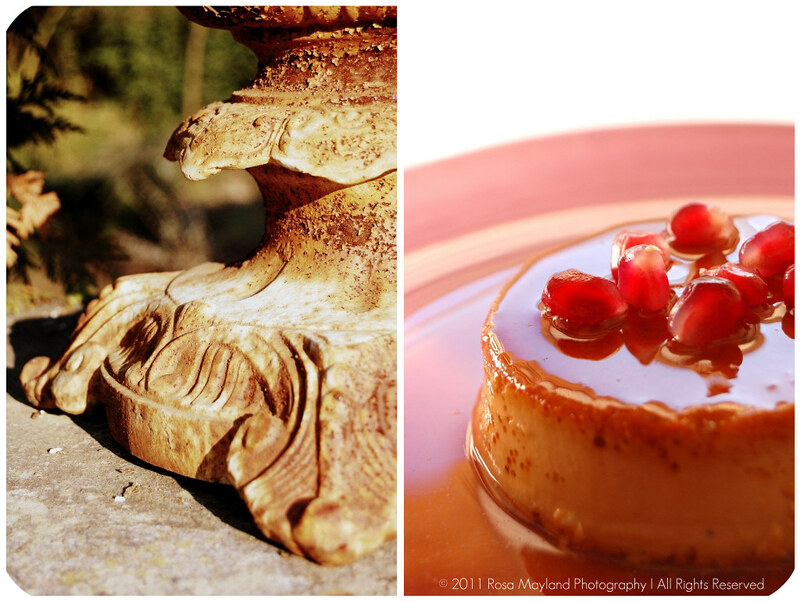 That's a delicious looking flan, especially with the pomegranate seeds as garnish. Gorgeous! Just the thing for Valentines Day. "Why make things so complicated and follow the flock when you can free yourself from such ties and live your love in a much healthier way?" Love that you said that. It's so true. Really lovely photographs. Hope you had a happy day! Oh, My Word!! 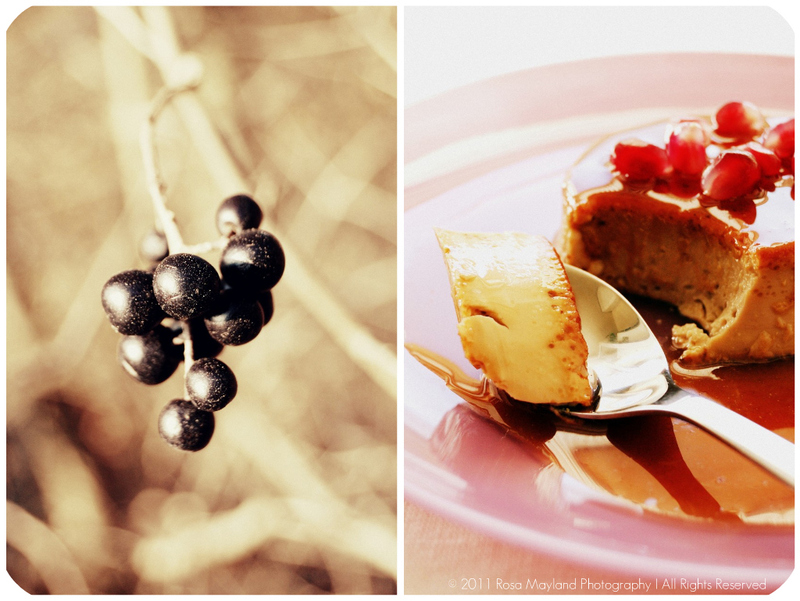 !This flan looks lovely and deliciously good :) And Amazing pics as always. Your flan looks so creamy and delicious, love the use of tea here! Rosa your pictures always blow me away! Your talent is AMAZING! I have never tried 'Flan' before, but you make me want it now! Sounds heavenly! Oh goodness! This flan looks irresistable. Hope you had a good VDay. genius! happy v day rosa! Caramel Flans have always been music to my ears. And you've created quite a symphony of flavors here. Beautiful! I hope you had a very romantic V-Day, Rosa! Rosa, Caramel Flans have always been music to my ears. And, once again, you have orchestrated a perfectly romantic dessert. Hope you had a wonderful V-Day! C'est original avec du thé etbeau comme tout avec des graines de grenade. Love the pictures. It's like a simmering pool of deliciousness! Qu'est-ce que ça donne envie!! vraiment très raffiné, j'adore! Oh awesome! Love the pictures. Nice work! Rosa, I don't celebrate Valentine's Day, but for a bite of this dessert I think I could be converted. Looks amazing! I love flan to begin with, so I know I would go crazy for one with the brilliant taste of tea. Wow these look so delicious, the photo where you've taken a spoonful out makes me want to eat one now! This tea sounds so gorgeous! Love what you've done with it - the flans look adorable. Your pictures are beautiful ~ And your dessert is stunning! They certainly are flawless! Beautiful, beautiful. Toujours aussi beau ton blog, j'adore ! Ce flan a l'air exquis. Love Le Palais de The, I always stock up when I find a store on my travels. This tea caramel flan is just inspired. It looks delicious. I love the addition of tea flavors in dessert and I bet it doesn't get any better than this. oh rosa! admittedly, i'm not the biggest flan fan, but this is gorgeous! Bonne idée d'associer ce dessert avec des fruits rouges! Je suis sous le charme! Cette cuillère me fait terriblement saliver. Your tea caramel flans look just stunning & ooh so pretty too! MMMMMMMMMM,..;A special dessert best enjoyed with a loved one! OMG this flan looks amazing bring back childhood memories. My mom used to make it and I absolutely loved it, never attaempted it I love all things custard so this will encourage me. You have spoken my heart in this post. And who can resist a luxurious flan? Rosa the photographs of this silky dessert is just AMAZING!! These look even more beautiful with your gorgeous photography Rosa. We should celebrate love every day!